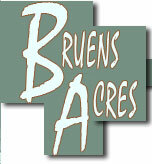 Welcome to Bruens Acres Paints web site. Our family revolves around our horses and we are proud of each and every one. Our breeding program strives to produce not only good confirmation, and stout horses, but horses with level heads, superb minds, and an overo pattern. Our horses are all family ridden in the mountians, fun gymkhana's locally, and have had sucesses in a variety of diciplines and show homes. Our 2019 foals are arriving throughout the spring!